This month’s Business Traveller explores the future of flight in Europe. 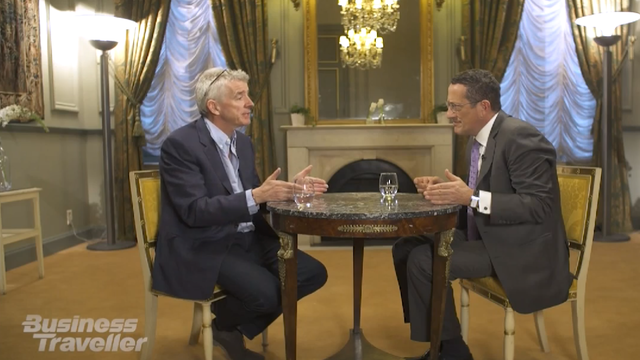 Host Richard Quest is joined by Johan Lundgren of easyJet, Michael O’Leary of Ryanair, Carsten Spohr of Lufthansa and Willie Walsh from IAG to discuss the continent’s congested skies and proposed environmental taxes. Richard Quest also speaks to consumer experience and technology expert Laila Pawlak of Singularity University to find out what she believes the future of flight will look like. Meanwhile, Anna Stewart experiences immersive art at altitude on board Lufthansa’s Flying Lab from Frankfurt to Austin, which aims to transport the boardroom to the skies. And in Copenhagen, CNN visits the airport’s oldest and newest terminals to explore how the journey from check in to take off has evolved over the last 80 years. It’s been said that that the best way to know a city is through its food. Feast On Dubai explores the culinary landscape of a city at the crossroads between East and West: a Middle Eastern hub, where cultures and cuisines from all corners of the globe have converged for decades, creating a food scene as diverse as the city’s population. The programme discovers how there’s more to Dubai than meets the eye as it looks back to the city’s trading past with star chef Vineet Bhatia, to see how Indian food has influenced the local cuisine. Known as the godfather of modern Indian cooking, Bhatia takes the programme to Bur Dubai where he shows CNN that there’s plenty of Indian fare to be found in the streets of the city – if you know where to look. As well as attracting Michelin-star chefs from all corners of the globe, Dubai is seeing the emergence of homegrown concepts. More and more chefs, artisans and farmers are embracing locality with the aim to find more sustainably food sources. CNN travels to Dibba Bay with chefs Nick Alvis and Scott Price to visit the first oyster farm in the UAE. CNN also meets Hattem Mattar, a chef who smokes brisket using a technique that has its roots in the American South but is infused with local spices. Asia is one of the biggest markets for the sport of rugby and it’s growing rapidly. Five years ago, rugby’s governing body set out to train, develop and recruit one million rugby players from Asia, which is soon to host the continent’s first World Cup. They not only succeeded in reaching their target but beat it by a full year. This month, CNN World Rugby’s Alex Thomas reports on the Singapore 7s and explores how and why the sport is taking off in some of the fastest growing rugby markets across Asia including India, Mongolia and Laos. The programme also speaks to a range of other guests from Bollywood star Rahul Bose who had an international career in rugby, coach of the US 7s team who also trained India’s under 17s girls’ team Mike Friday and Lao Khang from Laos who has just been announced as one of Forbes’ 30 under 30. This month on Quest’s World of Wonder, host Richard Quest travels to the dynamic Dutch capital, Amsterdam. The programme criss-crosses the bridges and canals to explore the beauty of a city famed for celebrating freedoms. During the programme, CNN speaks to architect Ellen van Loon who talks about urban renewal and regeneration. The partner at leading architectural firm OMA also takes Richard Quest on a tour of her favourite Amsterdam landmarks. Next, Quest meets award winning author Arthur Japin who explores the character of the city and takes a moment to reflect at Anne Frank’s House, whose teenage diary shone light on one of Amsterdam’s darkest moments. This month on Winning Post CNN heads to Sydney, Australia for the Queen Elizabeth Stakes, where, at Royal Randwick Racecourse, “Wonder Mare” Winx looks to extend her already record-breaking winning streak to an astonishing 33 races. With Winx’s owners Debbie Kepitis and Peter Tighe and trainer Chris Waller all in London for the Longines awards, host Aly Vance treats them to an insight into “The Big Smoke’s” equine history and an introduction to its few remaining working horses, the City of London Mounted Police. Next, CNN meets Winx herself at her training ground Rosehill Gardens where she shows off her form. The speculation is that the Queen Elizabeth Stakes will be her swansong outing and “Winx Mania”, a phenomenon that has been growing steadily over the last few years, is engulfing the Australian nation. Vance also seeks out some of the formidable filly’s most dedicated followers, all hoping to obtain “Ultimate Super Fan” status, on a day that could prove to be one of the most historic, not just for racing in Australia but worldwide.